Peter K. Haff | continent. Peter K. Haff is a scientist. He was not trained as a philosopher, of the nonhuman or otherwise. He points out frequently enough that his work comes out of an interest in creating useful terms and concepts within the sciences, amongst scientists. 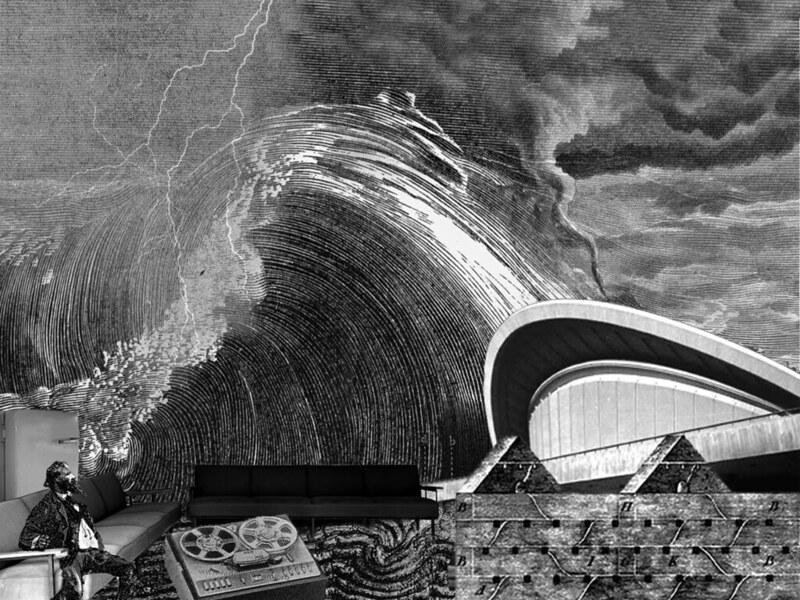 In Geology, the necessity of terminological inventiveness comes at the momentary attempt to grapple with shifting conditions and the increasingly collusive forces of nature, culture and technology. Professor Haff (Emeritus) researches and teaches Geology in the Nicholas School of the Environment at Duke University. Up until about five years ago, Dr. Haff’s publishing roster largely consisted of papers and research surveys with titles like “Rain Splash of Soil Grains as a Stochastic Advection-dispersion Process, with Implications for Desert Plant-soil Interactions and Land-surface Evolution” and “Regolith Thickness Instability and the Formation of Tors in Arid Environments.” At the moment, he’s writing and researching, still largely collaboratively, producing titles such as “The Anthropocene Biosphere” and further as sole author on papers like “Technology and Human Purpose: The Problem of Solids Transport on the Earth's Surface.” Peter’s research attempts to derive the physical properties of what he calls the “technosphere”, a term of description for a network of humans, society and technology that no longer—perhaps never did, but at any rate definitely does not now—depend solely on the details of its parts in order to continue to have operational agency. His is a non-anthropocentric perspective that explicitly attempts to reframe an understanding of our place in the world by directing attention away from individual human purpose toward the forces of co-option and co-relation that bind us, to this technosphere. Peter K. Haff’s Trigger Presentation at HKW Berlin, October 2016. PH: I worked for a number of years in physics and later on moved to Duke, and switched into geology and gradually became interested in where geology was going in the 21st century. I noticed that—this was true for myself—during our field season in the summer, we often went off to an undisturbed place on the globe to look at how the earth really worked. These are harder and harder to find, so finally I said, “well, really, it should have been clear to me before, the earth is doing something different now than it had been doing before.” But it is part of Earth’s function, so how could you understand all these new features of the modern earth such as the building, the room we are in here, the audio recorder you have—these are pieces of the earth, this is the earth’s function—but it does not fit into the normal geological paradigm, so what kind of frame could you build up to try to bring more coherence to thinking about society, humans, technology as part of the earth’s systems and other manifestations of what the earth is doing? So rather than thinking about inside—as we humans have constructed this building, there is somebody who designed it, there is an engineer, there are people working it, that is true as far as it goes—approximate causes why this structure is here. It is part of a much larger operation—the German government and world finance and what have you. There are many layers of causality that circle down, and so rather than trying to start at the human level and move up, we could try to start from the top—at the level of a global system of technology and humans. What are the most basic things that ought to be true even if we do not understand how the details work? The whole time, I was thinking about this as a scientific problem, really motivated by geological nature as the ultimate sense of what we are talking about. That is why we come to spheres—like hydrosphere, lithosphere, atmosphere—these are all sub-disciplines but they are really part of the geological earth in some way, and I think the technosphere is another such example. That is kind of the route by which I got into this business. cc.cc: While you were looking for ‘natural’ Earth processes, you ‘discovered’ the technosphere? PH: I used to work on natural earth processes, incurring great pains to make sure they were “natural” without obvious indications of human disturbance, but then realising that human disturbance was part of the scientific problem. That human intervention and human activities are part of the metabolism of the earth today, then realising that it is really a global thing: humans, technology, the internet, finance, trade, military operations—these are connected together. If you want to look at it from the outside, to get as coherent a picture as possible, sometimes you have to avoid diving into the details, and I needed a name for that: so I called it the technosphere. This idea has been around for a long time, this layer of human stuff, but to call it the technosphere you defocus from the human aspect—humans are critical, they are an essential part—but if we start thinking about the human intentionality of building and doing, and operating the way we do, I think one tends to lose sight of some of the constraints that are imposed by the fact that we are part of an earth system that is organised in a certain way. Organisation is key: this is a highly organised space, the building is highly organised, Germany is highly organised, the world is highly organised at a certain level—even above what nature on her own, as we might have said at one time, would do. And organisation has its own prerequisites, it has its own requirements; to be organised, things have to cooperate on some degree, they have to work together. That is one characteristic that must be true for the technosphere; coordination and cooperation has to be some part of the global description of what is going on. 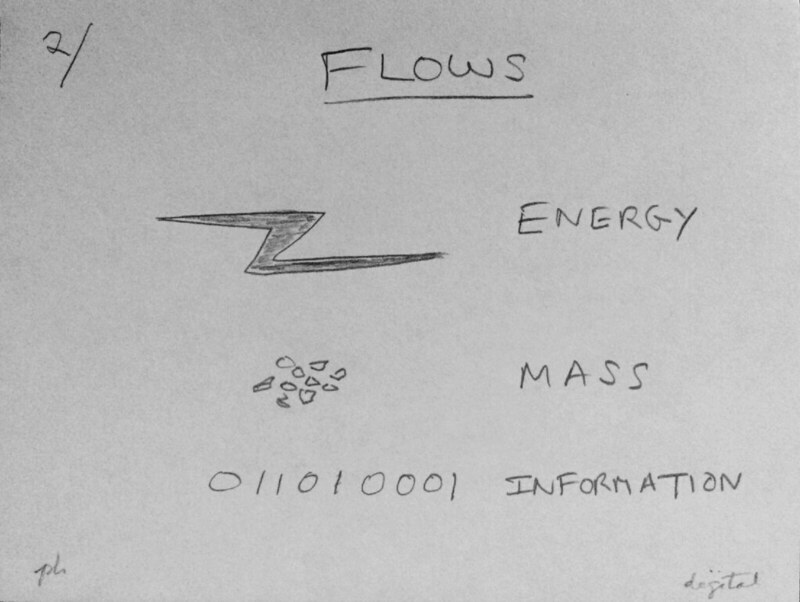 The great thing about taking organisation as a cue to getting a handle on the technosphere is that so far we have not had to say anything about how the parts actually function, because who knows how it really functions? So all the things people do, all the things they build, all the institutions, come under this larger outside view of organisation, which has its own rules. You can step back and say "whatever is going on below, it is going to need to respect that", and it is not always obvious if you start down with the weeds—the weeds have certain things they can and cannot do—and the virtue of doing it this way is that you do not need to know anything about the weeds to start with. So I find, sometimes in the humanities, people are upset with the idea of the technosphere because it may seem like you are coming in from physics, and you are trying to impose this rigid world that does not exist. But I am not imposing any rigid world, these are the most elementary things that I think need to be true for any system. There are just certain principles that have to be abided by; they are really, very non-specific, so there are not total, but very wide ranges of freedom to do what you want to do in the arts or humanities, or any of the sciences. It does not compromise in any way, except in some globally integrated way. There are limits of course, but if you think about it this way, you come up with some specific statements about what those conditions might be. cc.cc: The most frequent question seems to be “what is the technosphere?”, quickly followed by “where is it”? PH: Where is the atmosphere? There is some right here, there is some technosphere there: it does not seem quite as satisfactory an answer. This is a bit different, this piece of air seems kind of like that piece of air. It is actually not the same—the air is transparent to us, the technosphere is opaque. The air is transparent and, if we were allowed to smoke, if you put out the smoke, you'd see it does not just go out in some amorphous cloud. It, all of the little spirals, these little tendrils, come off and loop around, and those are following the little vortices that exist at all scales. There are big and small ones—down, down, down, they are all nested into another, down to microscopic size, before you finally get down to molecules. There is a huge amount of structure in here. So this piece of air right here is really different from this piece of air. You can't see it, the technosphere is like that—more varied, but that is the idea. So pointing to the technosphere, I could point to this glass, or that table with several things on it—to give you a little bit of an idea of the variety—like pointing to this and waving my hand. And a little bit of air: there is a lot more of it out there, and it goes all the way around the earth. How much do you want to know? That is a good description, that is what the technosphere is. Peter Haff’s drawings for the Trigger Presentation at HKW Berlin, October 10, 2016. PH: That is a very big question. There are extensions of the larger continent. publishing system, a little piece that has its own coherence, its own organisation, its own nook, its own budget, its own energy... Then HKW itself is a system that is operating on me and puts pretty strong constraints on me, on all of us; for example, when we leave this room, we are either going through, out through that door, or one of those. You have only three doors, you have three options, that is pretty serious control. We are used to that, and how else would you do it, you know? We are highly constrained by HKW in how we behave mechanically, physically; we are not sitting on a floor, we are sitting so we can see each other. That is not control, you just decided to do that. You told me to sit down here, right? And I obeyed, why did I do that? Why did I not sit over there, much further away? I probably could not hear you very well. I think I have some expectation, that I am part of the continent. system right now, trying to contribute some momentary part. At the same time with the HKW, I am a momentary part of that—the talk and the little discussion group—I was expected to behave in a certain way. I was going to give a talk that I was expected to give. I did do it, I did not consider not doing it; when I was doing it, I did not consider just saying that I am not doing this, I am pretty tired, I did not sleep well. I could have said that: I had a hard time focusing on Jürgen Renn’s questions, and after he asked them I had no idea what they were. I figured it is just one of the little things you can improvise on the last minute. That is all something that is part of the HKW system and I kind of have to do that, because—let's say I am not going to answer your question, and I just got up and left, there would be consequences. There is a social force acting on me to not disappoint, to work as hard as I can not to disappoint, and to contribute what I think, I owe them that. Where does this obligation come from? It is part of an unstated formal contract—it is part of an unstated contract with them, the way the technosphere works. Some things are forced, mechanical, like going in and out of these doors, very rigid. There is a police force if you get too far out of line, you get arrested and put in jail, and even get killed in some countries. So there are all levels, very hard physical constraints at the peril of your life, you have to obey. And that is here too, if you cross the street, you are part of the traffic system that is there—not that you are a part of that system if you are a pedestrian—but you have to respect it, it demands its own space, there are special places that you are privileged to cross. The system allows you to do that. So there's always this incredible nexus of systems that have these demands on us, that also give us something back. I did not ask for this [referring to bottle of water], it just magically appeared and it is part of how we are being taken care of. The system itself has to provide its input to the negotiation. 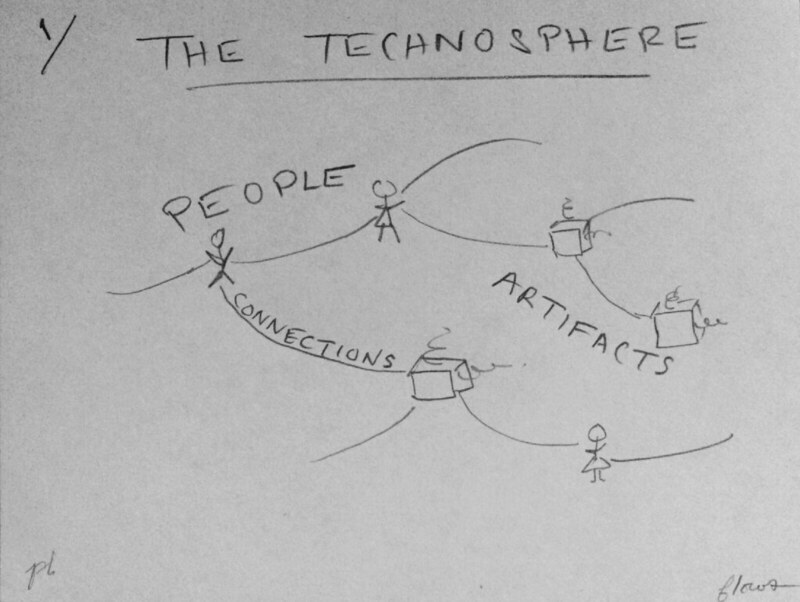 That is how the technosphere works. So there are multiple little connections that are coming in, and most of them are—this sofa here is a pretty physical thing—but a lot of them are invisible, or implicit, or contingent, and I think those are the most important, the most powerful. They bind everybody: those people eating lunch, facing each other, sitting in a certain direction—why do they not sit facing out? Well, it is easier to sit down facing out than facing in: you have to climb in there—why do you do that? Because there is a place for their food there, you can talk to people easily. They do not have to do it, but they almost have to do it; it would be impolite if they did not do it. All these forces that make them behave like that. But that is what the world is like. It is not just humans, all technological artefacts are under exactly the same regime. Certain things they are constrained to do. For humans, it is often incentivised, the things they are forced to do; it is much easier for the system. PH: I am a part of the technosphere: my clothes, this little tag here, my cell phone, those are the obvious things you would point to, the pieces of technology. But I consider myself and humans to be technological artefacts; they are basically manufactured by the technosphere. Most people put humans in the biosphere: you can put them there, but really we would not exist without the technosphere, we would not have the food, the water, the housing, the necessary security apparatuses, communication, transportation—99.9% of humanity could not live. We built ourselves out of technology, that is necessary and a product of humanity. It is not optional, you cannot opt out, it is there. Humans depend on it, and because they reproduce in the technosphere—maybe in your house—you create a new human, it is pretty much internal to the technosphere. We would not know how to live out in the woods, most of us, for very long. So I think it is that sense that people are really technological; we are biological, but in some sense were artefacts, produced by the technosphere for its own purposes. You can think about it that way. Just like red blood cells are manufactured by the body. And red blood cells are talking to their neighbours and having a nice time, and meanwhile they are serving the technosphere, they have a finite life time. We are a bit like the red cells of the technosphere, that would be the idea. PH: The tornado. Because you asked me about the technosphere, so I am looking for a system. I could choose any of these, this one is particularly dynamic, it is well isolated in the photo and easy to talk about. It is self organised, like the technosphere is; it takes in energy from the surrounding atmosphere and, ultimately, from the sun. It is making a huge impact on the earth where it is, it is tearing up the earth—and of course we do not tear up the earth everywhere, but we do some places. It has a finite lifetime, and the technosphere, as a system, has one as well. EDITORS’ NOTE: There are those in communities both scientific and nonscientific who would seem to be more interested in the definitional and lexicographical gatekeeping aspects of such terms than in the rich complexities they might bring to worlds of thought. But Giorgio Agamben, extending compliments to Gilles Deleuze, in defence of dilating dictionaries, asserts, "terminology is the poetic moment of thought." Giorgio Agamben. “What Is an Apparatus.” In What Is an Apparatus? and Other Essays. Translated by David Kishik and Stefan Pedatella. (Stanford: Stanford University Press, 2009), 1. David Jon Furbish, Elise M. Childs, Peter K. Haff, Mark W. Schmeeckle. “Rain Splash of Soil Grains as a Stochastic Advection‐dispersion Process, with Implications for Desert Plant‐Soil Interactions and Land‐surface Evolution" Journal of Geophysical Research: Earth Surface 114, (F3) 2009. Mark W. Strudley, A. Brad Murray, Peter K. Haff. “Regolith Thickness Instability and the Formation of Tors in Arid Environments" Journal of Geophysical Research: Earth Surface 111, (F3). 2006. Mark Williams, Jan Zalasiewicz, Peter K. Haff, Christian Schwägerl, Anthony D. Barnosky, & Erle C. Ellis. “The Anthropocene Biosphere” The Anthropocene Review 2, no. 3 (2015): 196-219. Peter K. Haff. Technology and Human Purpose: The Problem of Solids Transport on the Earth's Surface" Earth System Dynamics 3, no.2 (2012): 149-156. EDITORS’ NOTE: Duke University is located in Durham, North Carolina, the historic heart of the American South’s plantation culture, along with the booming 19th and 20th century American tobacco industry. The University’s founding endowment came from James B. Duke (nickname “Buck”), a tobacco and electric power industrialist. “Weder die Antithese von Natur und Technik, wobei »Natur« als Differenz aus der Subtraktion der Kulturschicht resultiert, noch die Vor­aussetzung von der »natürlichen« Technizität des Menschen führt an das Problem heran, das in der Technisierung als einem spontan in der Geschichte einsetzenden Prozeß besteht, der in keiner verstehbaren Beziehung zur Natur des Menschen mehr zu stehen scheint, sondern im Gegenteil rücksichtslos die Anpassung dieser seinen Anforderungen gegenüber mangelhaften Natur erzwingt.” Hans Blumenberg. “Lebenswelt und Technisierung.” In Wirklichkeiten in denen wir leben. (Stuttgart: Reclam, 1996): 16. EDITORS’ NOTE: In their discussion, Erich Hörl points out that one of the great advantages of Peter Haff’s work on the technosphere is that it helps to (re)define ‘the human’ as part of ‘the technological’. This essential feature of Peter’s technosphere theory is a point of differentiation that cuts across the various terminological creativities that have emerged in discussions of global technoscience, global warming, nonhuman agency and materiality, including technosphere, anthropocene, anthroposphere and technoecology. In dialogue with Hörl, Haff points out that there are “things going on in the world that embed humans within them, and humans are not really acting completely independently and as free agents in doing these things. There’s much larger forces at loose in the world—these are the forces of the technosphere—that would make using the phrase anthroposphere a bit misleading. Maybe ‘technosphere’ is a bit misleading too, except that I’m happy to define people as elements of technology if we get there, which I don’t know how well that would go over in some quarters. As I’m talking about the technosphere all the time I’m thinking about techno-ecology.”Erich Hörl and Peter K. Haff. “A Matter Theater.” October 18, 2014 at Haus der Kulturen der Welt, timecode 13m34s. EDITORS’ NOTE: During the discussions, interviewees were asked to pick from a set of somewhat random images. This collection of different phenomena served as a prompt for thought on the forms of appearance and the visuality of the technosphere. You can view the set here www.flickr.com/photos/57221817@N07/25411316686/in/photostream. The discussion here refers to www.flickr.com/photos/57221817@N07/25071243589.